Defender Jimmy Callacher walked away from Windsor Park on Saturday clutching the match ball after bagging his first ever hat-trick. Although he was thrilled with the win over Newry City – which took David Healy’s boys to the top of the Danske Bank Premiership table – the 27-year-old Callacher cheekily revealed he would have preferred a clean sheet, rather that his unique treble. He headed home a Joel Cooper corner kick after only 10 minutes before repeating the dose, this time from a Kirk Millar delivery. Battling City, neat and tidy on the ball, had the audacity to pull one back – only the third goal the Blues have conceded in the league this season – through Kevin McArdle, but it was left to Callacher to finish the job with another booming header following a delicious cross from substitute Niall Quinn. Modest Callacher said: “I’ve previously hit doubles against Ards and Warrenpoint Town but this was my first treble. The boys were bantering me at half-time about getting a hat-trick. “I was lucky. Quinnie (Niall Quinn) put in a great ball (for his third) and it just fell nicely for me. I couldn’t really have missed it. The delivery from the boys today was top notch. I had a couple of other chances that I maybe should have done better with . . . I probably caught them too cleanly. “The boys put the ball in the box and we just try to get on the end of them. To be honest, I would have swapped the hat-trick for a clean sheet. I’m prided on keeping people out. My job is to stop goals, not score them. Although the Blues are flying high at the top, Callacher stresses that no one at Windsor Park will becoming carried away. “Our objective is to better what we did last year,” he added. “We are a lot stronger this season . . . and the new lads have given us a different dimension. We have great pace in the team. If you look at any league in the world, the game revolves around pace. “Nothing is handed out in October. Our mantra is one game at a time and keep picking up three points. We are maybe at the top of the table, but it’s where you finish at the end of April that counts. City boss Darren Mullen branded his team’s defending as ‘criminal’, conceding from three similar set piece routines. 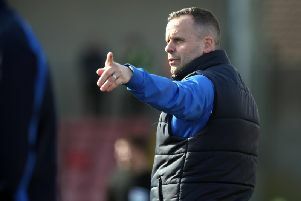 “Linfield are by far the best team we’ve played this season,” he said. “I thought for large parts we played quite well – I don’t think we looked out of place. “Even when we pulled it back to 2-1, we conceded a third goals seconds later . . . we couldn’t hold out which would have set up a different final 10 minutes or so. “A goal like that deflates a team especially after getting back into the game. Losing our defender Darragh Noonan so early was also a blow – he’s the third central defender we’ve lost this season. LINFIELD: Carroll, Robinson, Callacher, O’Connor (Waterworth 77), Cooper, Millar (Quinn 63), Clarke, Kearns, Mulgrew, Garrett, Mitchell. Unused subs: Stafford, Stewart, Fallon, Reynolds, Casement. NEWRY CITY: Coleman, King, Noonan (McArdle 12), Boyle, McCann, Walker (Teggart 59), Carville, McCabe, S Hughes, M Hughes (Delaney 65), Montgomery. Unused subs: Maguire, Lavery, Johnston, Mullen.